If you have worked and been resident in the UK and have left to live somewhere else during the last four tax years, you may be able to claim back some or all of the tax you have paid. Do I need any other forms? Your tax code is or was incorrect. You did not use all your tax free allowance during the tax year in which you left the UK. You have not reclaimed all the expenses for which you are eligible. These may include professional fees, the cost of tools and equipment for work purposes, business mileage, or laundry costs for uniforms. You may be due several hundred pounds, or more depending on your circumstances. If you are eligible to claim leaving the UK tax back the amount will depend on your income and how much tax you have paid. All sources of income are taken into account, including earnings, interest on savings and investments, money from rental properties, and benefits. When you leave the UK to live elsewhere, you should fill in a P85 form. This form should be sent to HMRC, who will issue a tax refund if one is due. The P85 form contains information concerning your employment in the UK and elsewhere, and the date that you leave the UK. It is important that your final P45 form is included, if this applies to you. Your P45 is provided by your employer when you finish work. If for some reason you are unable to obtain a P45, you should ask your most recent employer(s) for a statement of earnings. Your P60 certificate gives details of the tax you have paid. You should include this with your P85 form. The P11d certificate gives details of various benefits and expenses that you may receive from your employer. You usually only need a P11d form if these benefits and expenses have a cash value of over £8,500. When leaving the UK each application for a tax rebate will be considered separately. HMRC will look at your personal circumstances to determine if you are due a tax refund. It may be necessary for you to complete a Self Assessment tax return when you leave the UK. If so, you will be contacted by HRMC after you have submitted your P85. If a Self Assessment tax return is requested, you will not receive any refund until this is completed. You are likely to be asked to complete a Self Assessment tax return if you are self-employed, or if you receive money from other forms of income such as rental properties in the UK. You may also be asked to complete a Self Assessment tax return in some other circumstances. 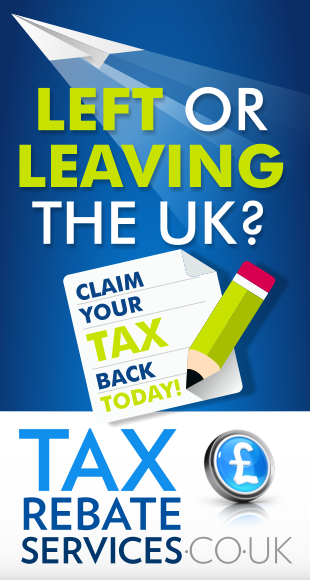 Free Leaving the UK Tax Back Calculator.